Dan Westwood – looks nothing like Tes Robinson. 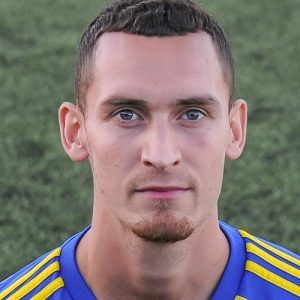 A second-half header by Dan Westwood from a Lee Chilton corner secured safe passage for Khalsa into the second round of the FA Vase, their ninth win in a row in all competitions. On a day where the howling wind battering Noose Lane was the leveller, Westwood’s 12th goal of the campaign was one of a handful of clear cut chances against the North West Counties outfit. The first half, in particular was largely spent with the ball swirling around in the air with players struggling to guess where it would land. Khalsa did have an early chance to take the lead, Mensah Kinch sneaking past the defensive ranks only for his shot to be parried away by Winsford keeper Michael Langley. It was to be the only real goalmouth action until 31 minutes when Carlo Franco headed over from six inches out from a Chilton corner. Five minutes later Westwood found the ball at his feet in a crowded area but was unable to get his shot away. As a warning just before the break, Sam Marshall broke the offside trap and raced clear, only to pull his shot horribly wide. The final action of the half saw a Westwood shot charged down for a corner from a Chilton pass. The second half almost started in comedy fashion, Khalsa keeper Sam Arnold having to tip over Langley’s wind assisted goal kick within 60 seconds of the kick off. On 50 minutes, the decisive moment arrived as Westwood’s shot from Alex Melbourne’s great left wing cross was charged down for a corner from which he headed home unchallenged to make it 1-0. Four minutes later, the impressive visiting skipper Will Foster made a fantastic challenge to stop Westwood after he sprung the offside trap. Two minutes later Foster was again in action, turning Chilton’s probing left wing cross onto his own crossbar before it reached Westwood who would surely have scored. There were half chances for Rico Taylor and substitute Josh Thomas as Khalsa pushed for the second goal and on 72 minutes Westwood headed over unmarked from another Chilton corner. Tes Robinson volleyed an effort just over the bar from the edge of the area on 78 minutes and the final chance of the game went to Taylor whose shot from the edge of the area clipped the top of the crossbar to safety. Sporting Khalsa: Sam Arnold, Carlo Franco, Alex Melbourne, Shawn Boothe, Tes Robinson, Liam Armstrong, Rico Taylor (Alex Woodhouse), Dave Meese, Dan Westwood, Mensah Kinch (Josh Thomas), Lee Chilton. Subs not used: Luke Adams, Jonathan Haynes, Vidal Hendrickson.